The Class and Component prices for May 2014 were announced on June 4. The Class III price was down $1.74/cwt., but at $22.58/cwt., it is still a very good price. 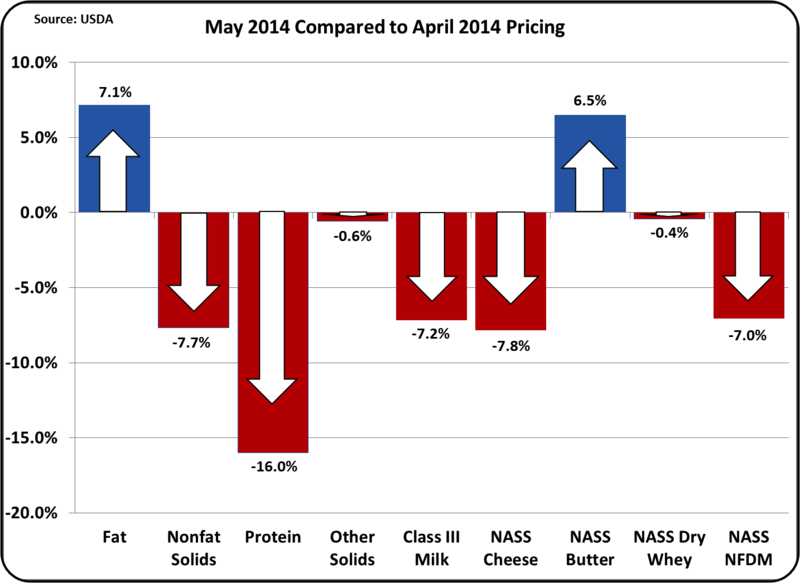 Milk protein prices was down significantly with the fall in NASS cheese prices. 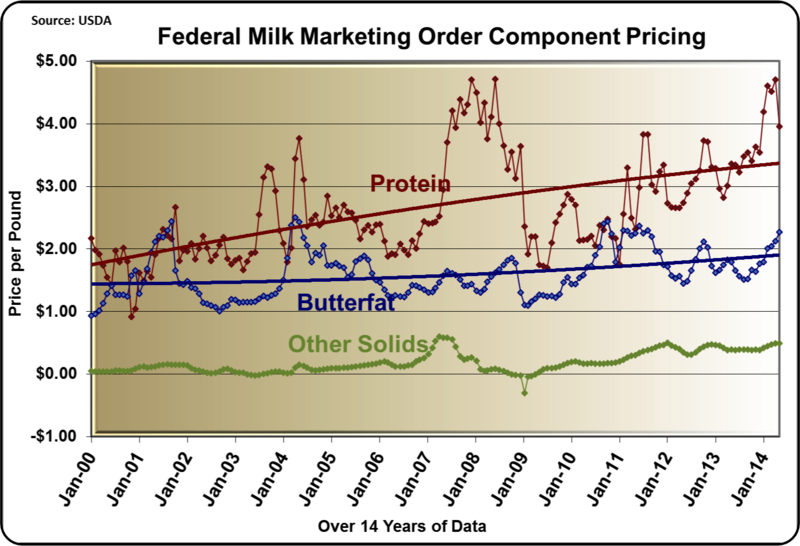 However, butterfat was up significantly reflecting the increased NASS price of butter. A higher butterfat price has a negative impact on the price of milk protein (see explanation below). The long-term trends reflect the plunging price of milk protein and the excellent price of butterfat and other solids. Other solids at $.49/lb. is near April's high. This price level for other solids has not been seen 2007. This has created a very different pie chart of the Class III milk price by component. 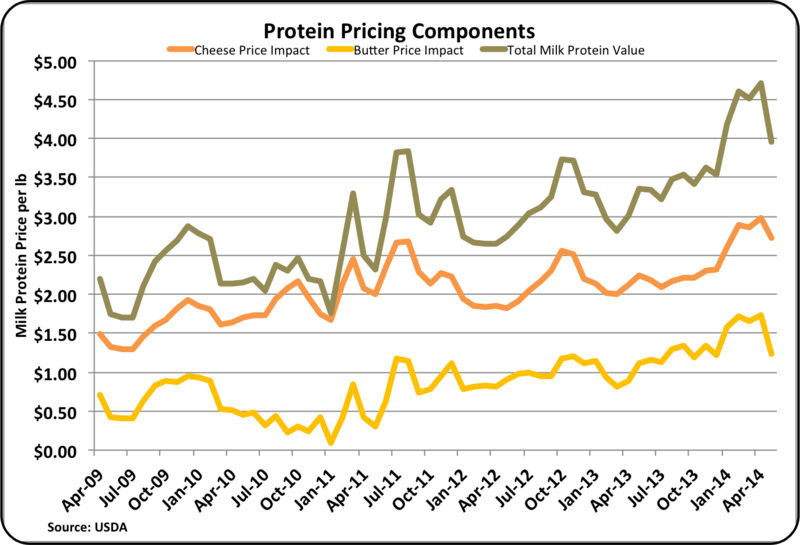 While payment for protein still dominates the Class III price, May's pricing relative to April's has taken 5% from milk protein and added 5% to the contribution from butterfat. In 2013/14 we have seen Class IV milk priced higher than Class III. For the impact of this, see the February 25, 2014 post to this blog. In May, the Class IV price ($22.65/cwt.) was again higher than the Class III price ($22.57/cwt.). WHAT HAPPENED TO PROTEIN PRICES? In May, milk protein prices dropped by $.75/lb. or 16%. In April, they were at $4.71/lb. 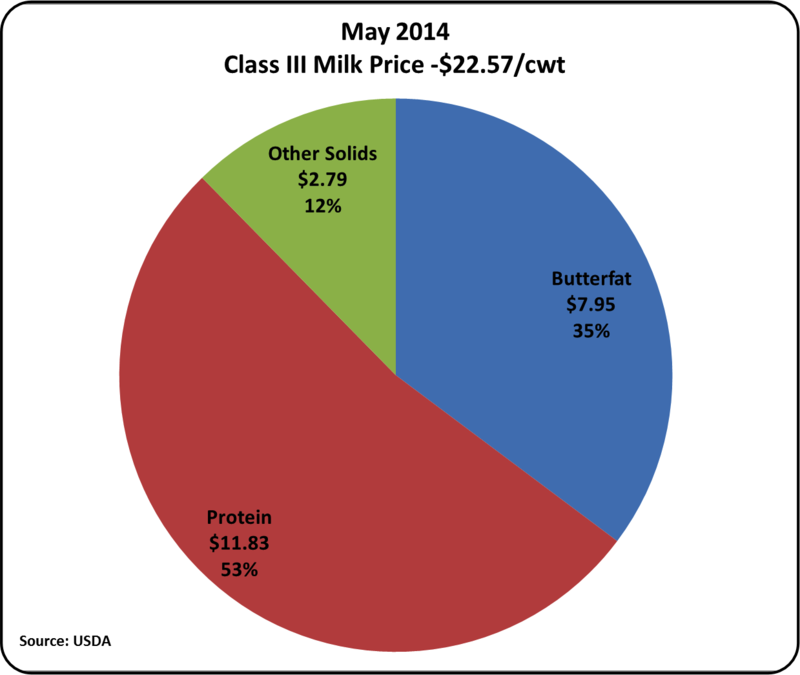 In May, milk protein dropped to $3.96/lb. Cheese prices are used in Federal Order formulas for determining milk protein value and cheese prices have fallen significantly. The NASS price for cheese in May was $2.17/lb. vs. $2.35/lb. for April. The current CME pricing for blocks and barrels is running close to $2/lb., which indicates that the NASS cheese price will continue to deteriorate in June. The price of milk protein is made up of two elements shown in the chart below. The lines show the value of both elements and their combined value of milk protein. The one element in the formula is the value of protein based on the wholesale cheese price, less the make allowance and then adjusted for cheese yields. The other element is the increased value of butterfat when it is used in cheese rather than butter. In May, the falling price of cheese and the increased price of butterfat contributed to the significant drop in the price of milk protein. As mentioned above, the CME price for cheese would suggest a lowering price for cheese in the June NASS calculation. CME prices for butter are holding constant at this time. This would suggest that milk protein will fall further in June. However, in looking at the underlying elements, the longer term value of cheese and milk protein looks quite good. 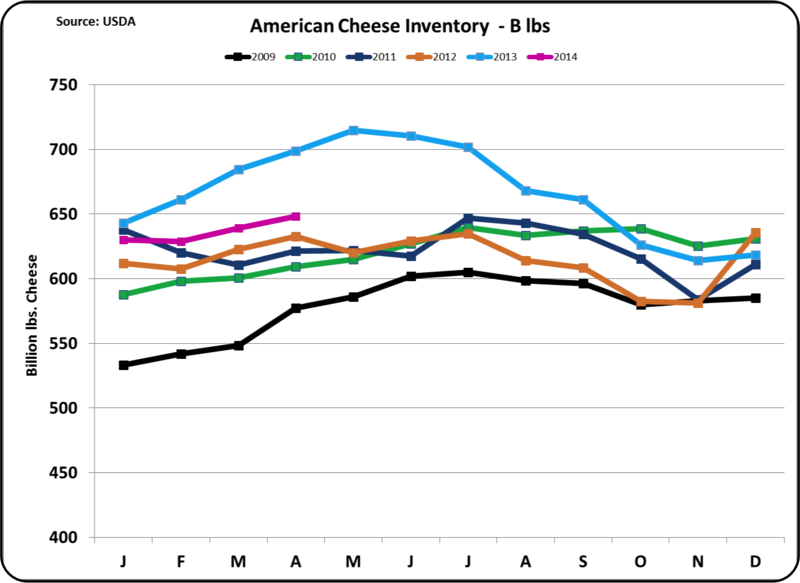 Cheese inventories remain low, and cheese exports remain high. 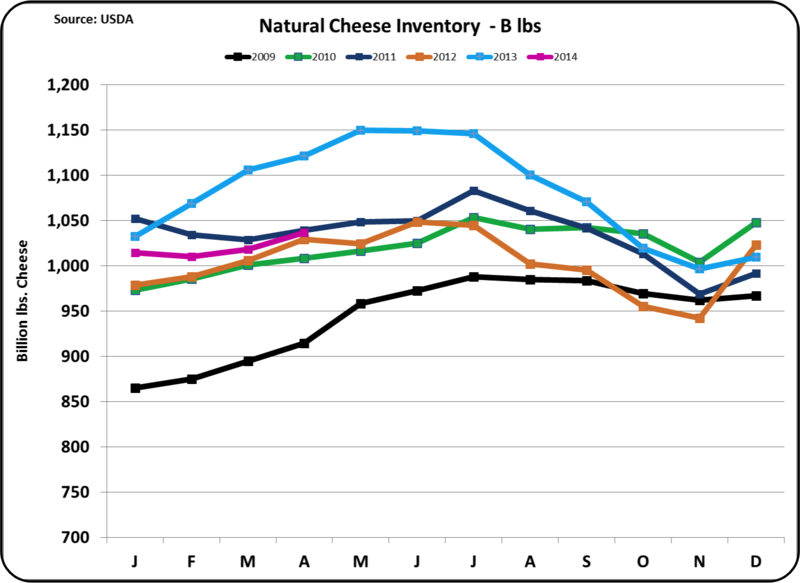 Through April, stocks of Natural and American cheese are well below 2013 levels. Also, cheese exports remain well above 2013 levels and are up 35% YTD. While Mexico has been our largest cheese importer for years, in April, exports of cheese to South Korea and Japan both exceeded exports to Mexico. This is a strong sign that the U.S. dairy export program is diversifying internationally and gaining sales to newer customers, not just increased sales to our oldest customer. Other solids prices are based on dry whey prices. 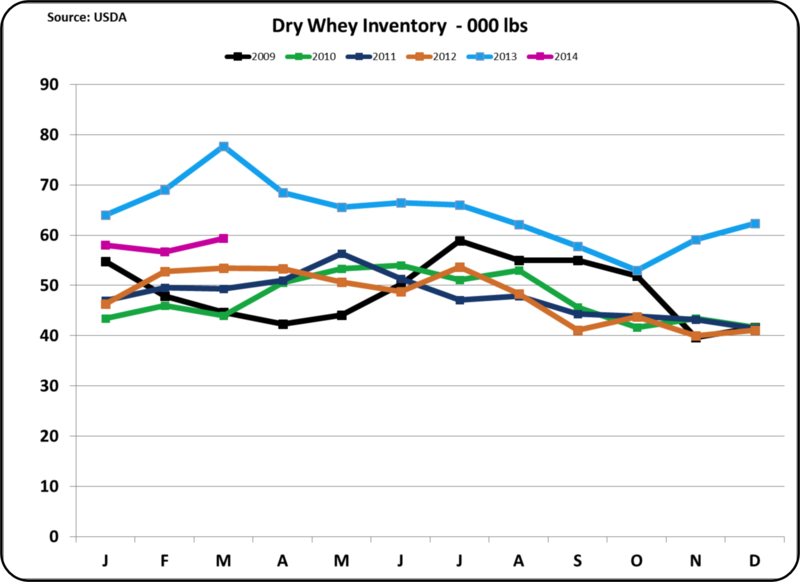 Dry whey exports remain robust, up 15% over the 2013 YTD. As shown in the chart below, inventories remain low, as compared to 2013. 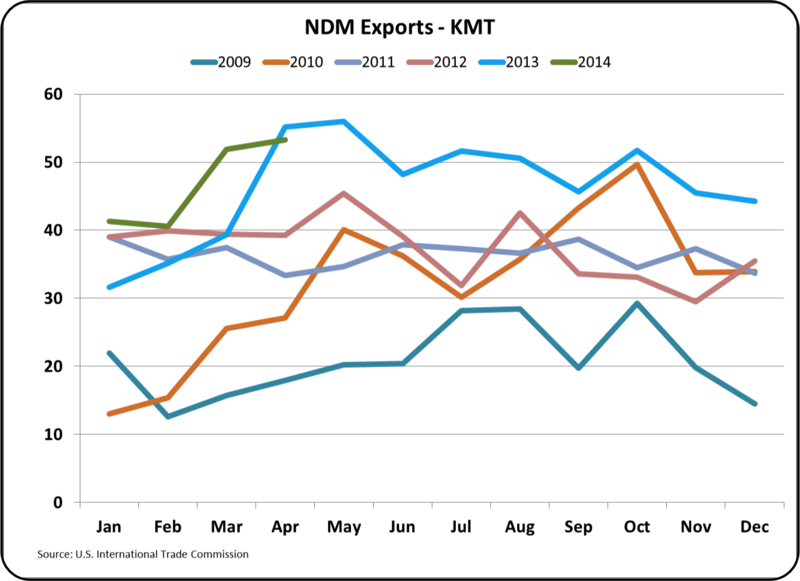 Nonfat Dry Milk/Skim Milk Powder (NDM/SMP) remains a strong export item. This is USA's largest export product. Sales YTD, as shown below, are above the prior year. April exports were strong, but below 2013 levels. The USA dominated this category internationally in 2013, but maintaining this may be difficult in 2014. Sales of NDM/SMP are the basis of the Class IV price. As mentioned above, its impact on producer milk pricing was reviewed in the February 25, 2014 post to this blog. 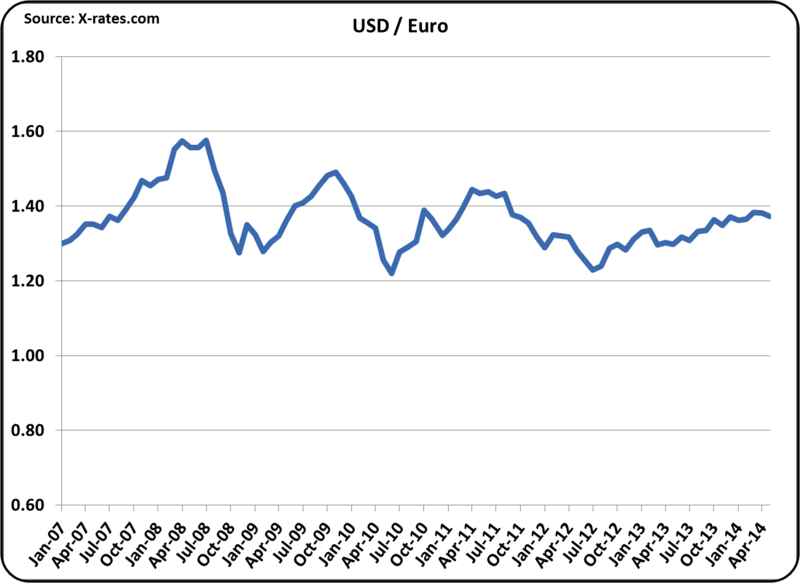 Exchange rates remain stable to favorable for exports. 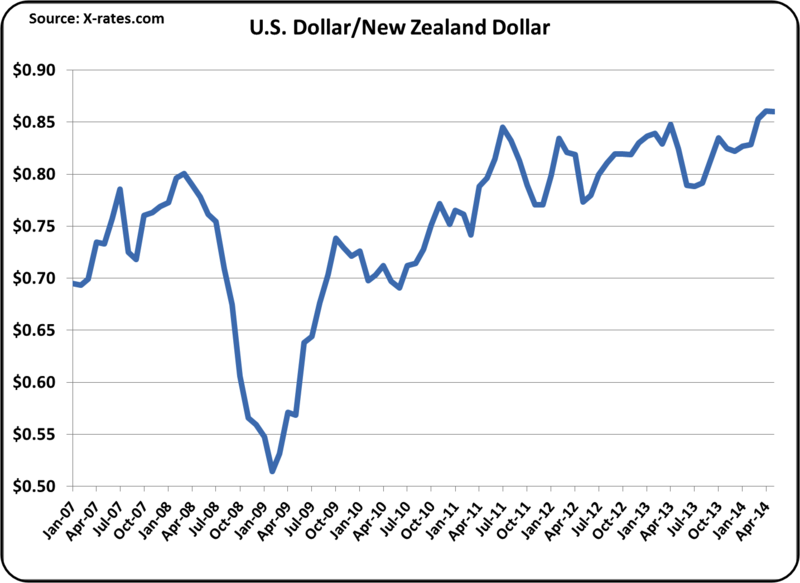 Shown below are the USD vs. the NZD and the Euro, the currencies of two biggest international dairy exporters. Producer milk pricing remains excellent. Class III milk, milk protein, butterfat, and other solids are all priced near record levels. This monthly drop in protein value should not be a concern. The current milk protein price is not bad and the fundamentals are still sound for pricing recovery of this component. The outlook for 2014 remains excellent for the U.S. dairy industry.